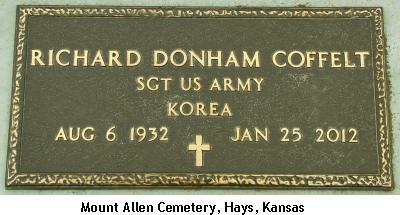 The Coffelt Database of Vietnam War casualties has its roots in an effort begun by Richard Donham Coffelt. A Korean War era soldier and later an attorney in Hays, Kansas, Richard became aware that the government had not made public a central source of information regarding the servicemen and women who died as a result of service in Vietnam. In 1980 Richard set out to determine the unit of assignment for each Army soldier who died in Vietnam. As this was two years before the IBM PC (personal computer) came on the market, the work necessarily was done the old-fashioned way: by library research, travel, and in hand-writing. In 1993-94, after PCs had become commonplace, Tom Holloway (Emory University, Atlanta) changed the landscape by obtaining the Department of Defense's casualty database and the Army Adjutant General's database in digital form. Using the university's mainframe computers to read the reel-to-reel computer tapes, Tom integrated the two databases and converted the information into a commonly used small-computer format. The "Holloway Database" effectively became the public's sole source of information regarding all our Vietnam dead. In the late 1990s, others joined Richard's effort, contributing information and collating the collected material into digital form using the Holloway database as a baseline. The additional resources allowed the project's scope to expand to include unit of assignment information for all service branches. In 2002, an early version of the Coffelt Database was deeded to the National Archives, which made it available on-line as a searchable database. In late 2006, the project scope was extended further by including circumstances of death information in the Coffelt Database - the "how and where" of their deaths. As before, emphasis was placed on obtaining hard documentation, a task made easier as material became available on the Internet from governmental and private organizations. The Internet cannot and has not replaced on-the-spot investigation, though; in example, one member of the Coffelt Group has photographed over 80,000 documents at the LBJ and Nixon Presidential Libraries and in the National Archives. These photographs have become a part of the Coffelt Database. Richard Coffelt's health began failing, and on 29 October 2010 he made his last contributions to the Coffelt Database. Others now continue the work Richard began 30 years ago. The Coffelt Database is an intellectual property with copyrights held by the Coffelt Group and other contributing organizations. There are some limitations on the search capabilities and downloading records en masse is not allowed. In general, DD1300, DA2496, and DD1330 photographs are copyrighted and should not be copied. Apart from these few restrictions, the Coffelt Database is open to the public - just as Richard Coffelt intended. The Coffelt Database available on this website is updated almost every night at 3 AM.